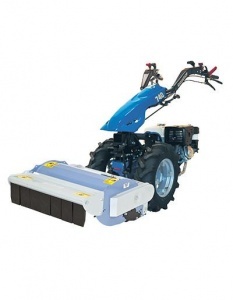 As well as a fantastic 85 cm wide flail mower, because this machine is built on BCS's impressive BCS 740 power unit it enjoys incredible versatility, compatible with over 25 extra implements. An ideal machine for carrying out mowing work on banks and steep slopes, Honda's Banks engine and wide lug wheels make it a safe and efficient machine. Supplied complete with a 85 cm flail mower. Benfiting from hydrostatic drive and assisted hydraulically controlled steering, this 85 cm wide flail mower enjoys easy operation, manoeuvrability and complete control, even in the toughest conditions.